The hacktivist group Anonymous is believed to have hacked Republican presidential candidate Donald Trump’s voicemail and leaked messages from 2012, which appear to show how the liberal media in the US is supporting the billionaire. Gawker published recordings, which were hacked by Anonymous and which contain 21 messages from MSNBC’s Joe Scarborough, Mika Brzezinski, and Tamron Hall. The media outlet said it was unable to independently verify the authenticity of the messages, though they do appear to be genuine. In one message, Scarborough can be heard saying: "We are so, so grateful for everything, Donald, and we just want to call you and tell you how much it means to us.” The journalists were believed to be thanking Trump for making a series of charitable donations. It would also appear that Scarborough confirmed that the messages were genuine after a series of tweets. The trio from MSNBC has been tasked with interviewing Trump as he bids to become the Republican presidential candidate. The latest revelations could raise questions of just how objective the journalists are being, when posing taxing questions to the billionaire. 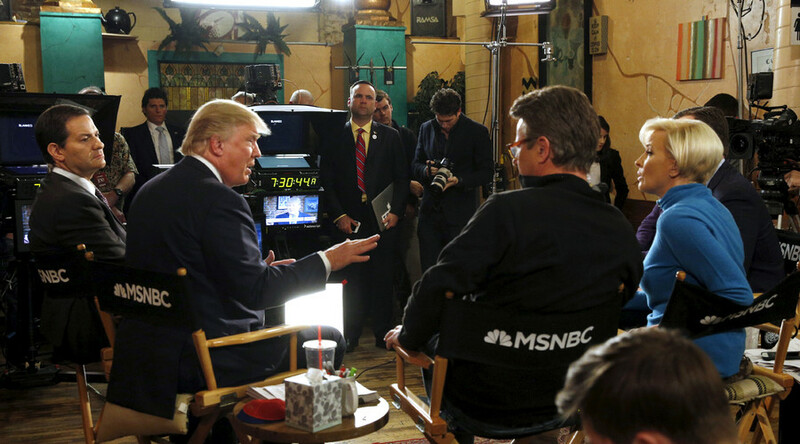 Leaked audio from an MSNBC interview in February showed that Trump instructed Scarborough and Brezinski to “make us all look good,” and asks for “nothing too hard” when Brezinski brought up the issue of whether to ask him about immigration policies. A report by CNN in February also cast light on the relationship between Trump and the MSNBC hosts. The broadcaster recalled a conversation between the billionaire and Boston talk radio host Howie Carr, in which Trump was glowing in his praise for Scarborough. "He's a great guy, and he has a great show ... and we have a lot of fun," Trump told Carr in January. "Joe's doing well. You know, he's making money for the first time in his life, really making some pretty good money." Through the years, we asked Trump (and many others) to contribute to various charities, including David Axelrod's CURE charity for epilepsy. Anonymous declared war on Trump in December after the property tycoon said he would look to ban all Muslims from entering the United States. A website for Trump Tower was taken down by the group and their petition to ban Trump from the UK gained more than half a million signatures. “It has come to our attention that you want to ban all Muslims to enter the United States. This policy is going to have a huge impact. This is what ISIS wants,” said Anonymous.